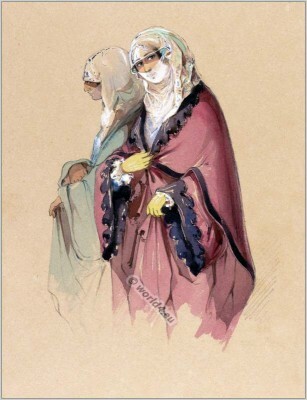 Women of Malta in traditional costumes. Home » Women of Malta in traditional costumes. Women of Malta in traditional costumes. Time of the Ottoman Empire. Drawing by Amadeo Preziosi 1851. This entry was posted in 19th Century, Ottoman Empire, Traditional and tagged Amadeo Preziosi, Ottoman Empire costumes, Traditional Malta dress on 9/14/13 by world4.